Burrowmoor is a very popular, successful primary school situated in the rural market town of March. It offers extremely high standards of education for children aged between 2 and11 years, with before school, after school and holiday care available each week day between 8 am and 6 pm. Burrowmoor is primarily a place for pupils, family, staff, governors and the community to learn together in partnership in an atmosphere of co-operation and understanding. We believe that every individual brings different experiences and strengths to our school that are valuable. We aim to build on these by offering an education that is stimulating, appropriate and challenging. We 'Aim for Excellence' in everything that we do and set high expectations in all that we achieve. We encourage children to learn from first hand experience and to take an active part in the learning process. We want children to develop academically, personally and socially. We aim to deliver a broad based curriculum to all of our children, to foster in them a love of learning and an understanding and respect for the world in which they live. We aim to provide an open, welcoming and stimulating environment in which every child feels safe, valued and happy. We encourage parents and the wider community to take an active interest in the education of all our children and to feel an ownership of their school. 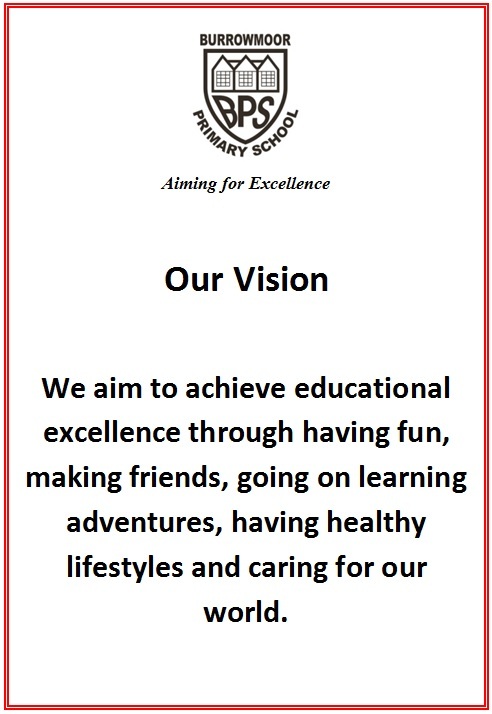 We welcome your continued support as we share with you our vision for the school.